Central Mortgage & Housing Corp. Air Force Construction Report dated 31 Oct 52. Royal Canadian Air Force Construction Report dated 31 Oct 52. 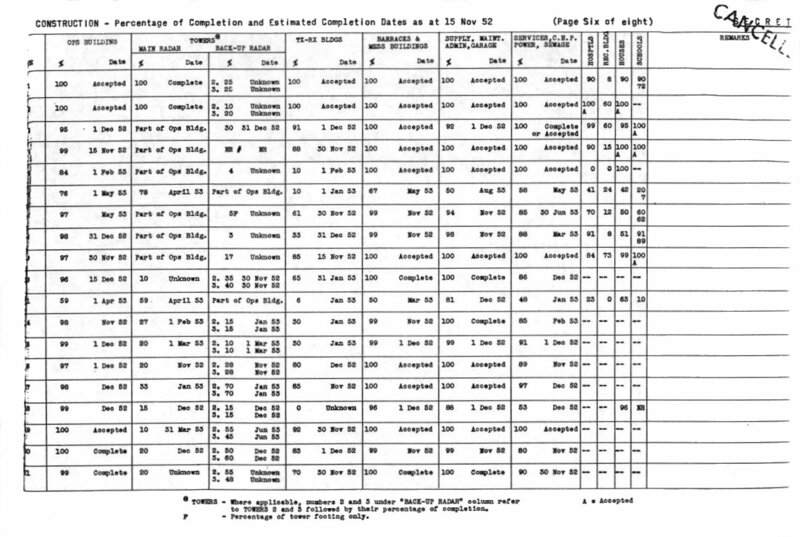 Northeast Air Command (USAF) site reports are based on Corps of Engineers (U.S. Army) Atlantic District Report of Progress as of 31 Oct 52 and AC&W Progress Report (CE Aspects) dated 31 Oct 52 (ENGKM-29). Weekly reports on USAF ADC sites by US engineer officers on these sites. Liaison with RCAF personnel concerned with construction. (ii) - Overall Percentage of Completion of sites has been arrived at by a slightly different method than in previous reports. Since at most sites the percentage of completion of the towers is such that it would distort the overall picture by lowering the overall percentage picture, they were not included. Likewise, guard houses, hospitals, drill and recreation buildings were not included. These figures are all shown separately as are married quarters on those sites where they are being provided. (iii) - Acceptance of buildings by RCAF and USAF has been done in most cases with some construction. However, for the purpose of this report, if a building has been accepted, it is shown as 100%. (iv) - Airstrips: A number of airstrips are to be provided with hard tops on runways and this has necessitated a revision in their completion dates. Other strips which are near completion are serviceable at present as shown. Val D’Or, PQ and Casey PQ were designated as one squadron air bases but since it has been difficult to find suitable ground for the necessary buildings at Casey, the decision as to whether or not to proceed with its construction as an air base has been held in abeyance pending the results of an investigation into the suitability of other strips such as La Tuque or Lac des Loups as alternative sites for the one-squadron air base. (v) - Construction on most sites will slow during Christmas season since many contractors will be allowing workers a two-week or a ten day holiday. (vi) - Where a number of buildings (such as barrack buildings) have been shown under a single percentage figure the completion date showing beside that figure is that of the last building to be finished. (i) - USAF ADC Sites: USAF advance elements of 15 men each are scheduled to arrive at USAF sites noted below on the dates shown. The balance of the advance detachments (approximately 40 men each) will arrive as close to two weeks after the first elements as is feasible. (ii) - RCAF Sites: Changes noted in RCAF site beneficial occupancy and limited operations dates made in this month’s report were based on information supplied by AMC RCAF. These figures are not firm and can only be used as a guide. 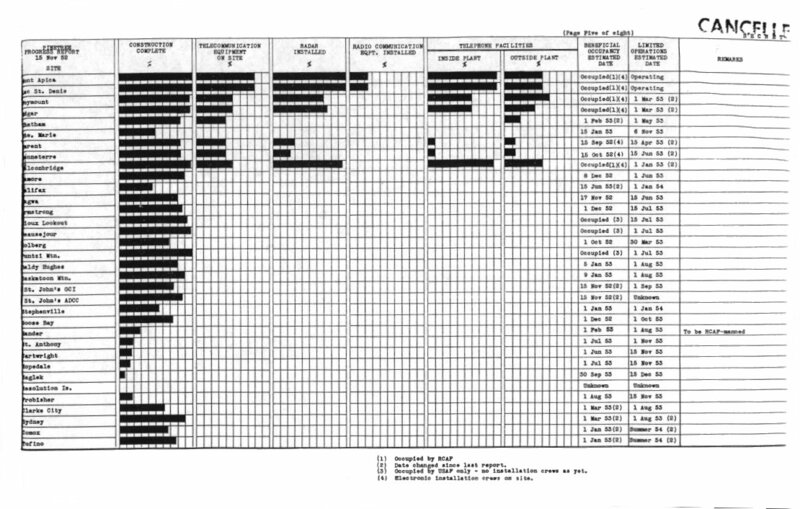 (i) - Tie Lines: There has been no change reported on tie lines availability since the 15 Oct 52 report so the primary communications diagram has not been included in the present report. Foymount: A cable line to Eganville has been erected. It is not loaded nor is it available for use as of yet. Beausejour: A 25-pair line has been constructed to the base from existing commercial facilities but as yet is not terminated or in use. Armstrong: Cable from existing CNR facilities at railway station now being constructed to camp administration building. Ramore: Circuits (2 voice, 1 teletype) from Ontario Northland Railroad facilities to the site are built to the administration building. No instruments or terminating facilities available as yet. Phase 1 - (St. Hubert – Lac St. Denis) - Contractor given until 1 Nov 52 to complete tests showing that microwave equipment has characteristics necessary to meet RCAF over-all requirements. Phase 2 - (Foymount - Lac St. Denis) - Equipment deliveries held up pending tests on Phase 1. Phase 3 - (Edgar - Foymount) - Construction will be completed to permit installation of equipment late in November. Phase 4 and 5 - (Edgar - Falconbridge and Falconbridge - Parent) - No change. Phase 6 - (Mont Apica - St. Hubert) - Construction commenced as a result of permission obtained from Quebec Government to enter Quebec-owned lands. Phase 7 - (Parent - Senneterre) - Legal surveys proceeding to permit acquisition of land. Construction will not be commenced until AFHQ authority given to proceed with microwave installation. Phase 8 - (Senneterre - Mont Apica) - Legal survey data presently in preparation to obtain access permission from Quebec Government. Construction may proceed as soon as access permission granted. (b) - VHF air-ground-air communication is in and functioning operationally as Sites 1 (Mont Apica) and 2 (Lac St. Denis). The equipment in use is not the final standard equipment (which will be installed at a later date). Plans for VHF systems at Sites 3 (Foymount), 4 (Edgar), and 9 (Falconbridge) are completed. [c] - HF back-up communication is being installed at Site 1 (Mont Apica) and installation work will begin at Site 2 (Lac St. Denis) in a week or two. Drawings and materials are at such a stage that HF back-up equipment could be put in at Sites 3 (Foymount), 4 (Edgar) and 9 (Falconbridge) at the same time as VHF air-ground-air equipment is installed, although slower delivery on HF equipments would mean a lag behind VHF installation progress at the beginning of such work. CR91A Receivers - Packing and preservation and consignment instruction have been issued to the manufacturer. AN/FRT 501 Transmitters - Available dates and shipping dates have been revised from Dec 52 - Feb 53 to Jan 53 - Apr 53. The VHF antenna to be used with Pinetree VHF equipment has been changed from the UAG-66 to the AS 5003/U. Falconbridge - Main radar is installed and undergoing preliminary tests. It is anticipated that installation of two ISG 98 sets will be delayed two weeks, making the estimated installation completion date 15 Dec 52. Foymount and Edgar - Main radar installation is well advanced. Radomes have been erected. Parent and Senneterre - A good start has been made on main radar. Installation work will, in mist cases, cease for two weeks during the Christmas season due to holidays. In a few instances there has been some delay in the signing and returning of the classified document receipt enclosed with each report. Prompt attention to this detail by the addressee will obviate difficulties which have arisen such as the tracing of reports through mails etc. In order to ensure maximum security subsequent copies cannot be sent until receipts for the current issue are received by this office. Page 4 of 8 is not available. Matrix showing progress of construction, equipment and radar. 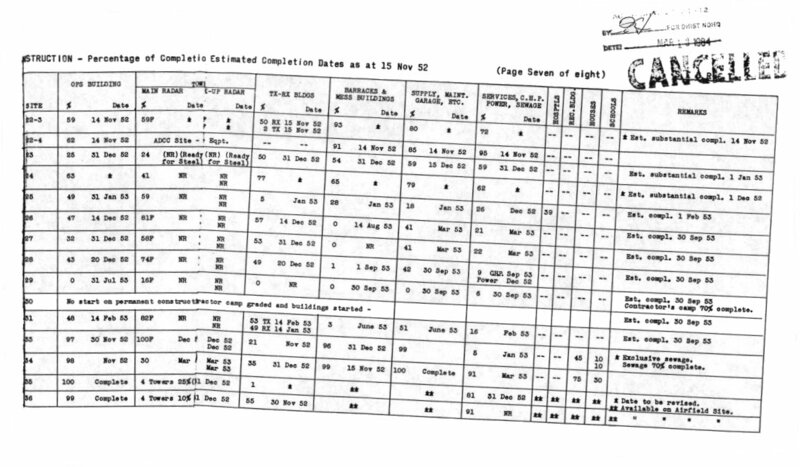 Matrix showing construction, Percentage of Completion and Estimated Completion Dates of Radar sites. Matrix showing construction, Percentage of Completion and Estimated Completion Dates of NEAC sites. 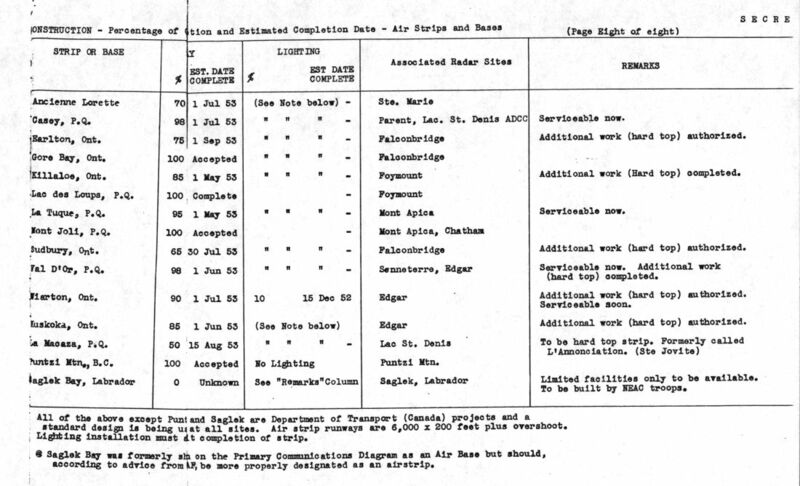 Matrix showing construction, Percentage of Completion and Estimated Completion Dates of Air Strips and Bases.